Home / Why ELEX Amazon Payments Gateway for WooCommerce? Why ELEX Amazon Payments Gateway for WooCommerce? Amazon payments gateway for WooCommerce is one of the fastest growing gateways in terms of integrations as well as customers. A report from January 2016 states that there were 310 million active users registered with Amazon.com. And as much as 65,000 businesses are using Amazon Payments as one of the gateways in their stores. Since there is no stopping of the popularity of Amazon, its customers are growing at a high rate per financial year since 2014. These customers are already familiar with this payment interface, which makes it trustworthy on other sites too. How Amazon Payments Impact Your Business? Once you buy and activate the Amazon Payments Gateway Plugin, you need to go to Amazon Seller Central. Here you are asked to enter the following information and Amazon provides the API credentials to us. You’ll need the API credentials to connect to Amazon servers. Setting up the Amazon Payments Gateway for WooCommerce store is quite easy. The test mode activates as soon as you enter your API credentials. In the test mode, you can check all your settings, before you go live. It is called Sandbox mode. And if you are not willing to buy the Integration Plugin, you have a Demo Version of the Plugin where you can check all the available functions in the plugin for free. This way, you will know if the plugin has the required functionality or not. Since customers opting for this gateway will already have an account with Amazon, he/she can log in to their Amazon account and pay for the products or services they are purchasing. They get the “Pay with Amazon” option in both the Cart and Checkout pages. Just by clicking the Amazon Pay button, customers log in to their Amazon account which has saved details from before. By doing so, customers are not redirected to any other page and there is no need to enter details again. This eases the payment process by the reduction in the number of clicks and filling of forms at checkout. Customers also get the option of recurring payments/auto payment. You can allow your customers to purchase products without capturing payments at that time. The pending amount is deducted from customers bank account every month automatically. In this way, customer loyalty is maintained intact for a longer period of time. Amazon Payments Gateway for WooCommerce is integrated with 1-Click Checkout feature. Customers get options to pay using Amazon. And just with that single click, transactions are completed. Customers don’t need to enter an address on each checkout as these are already saved in their Amazon account. They don’t have to provide the Bank account details to pay. There is no redirecting on every step, as all the details are verified already. On an average, any customer saves 70 seconds/transaction, when they are paying through Amazon Payments. The actual time taken to capture funds reduces to 2-3 seconds. Thus customers spend more time shopping, rather than remembering 2-3 passwords and filling long forms and waiting for the “loading – do not refresh” directs. So the swiftness stops your valued customers from abandoning carts due to the delay in transactions. The checkout process is in line with the execution of the automatic payment. This boosts your average order values per customer. Although data security is of prime importance to Amazon, you are supposed to have a Transfer Security Layer (TSL)/Secure Socket Layer (SSL) certificate before integrating Amazon Payments API on your site. This fortifies the transaction from all security lapses and possibilities of fraud. You should contact your website hosting provider for the same. All sort of financial data of the Merchant and the account of customers are safe with Amazon. Still, just to be on the safer side, you should have another level of security for your account. It can be achieved by setting up two-step verification, called multi-factor authentication (MFA). You require this two-way verification during the recovery of your Amazon account. Being aware of Internet scams like Gift Card Scams, Redirecting to off-site Transaction, Identity Concerns, Lucrative offers, etc. Identifying phishing E-mails by knowing the correct domain names and avoiding replies to such emails. Reporting any suspicious or spoofed emails. Amazon has customers in 170 countries, thanks to its eCommerce business. And all of its customers use the same payment gateway, i.e. the Amazon Pay. They are aware of the ease, speed, and execution of Amazon Payments. With 50% of the customers being Prime Members, that trust was not built overnight. Innovation and support have been their prime concerns. As result, stores using Amazon Payments have raised the average purchase for Pay with Amazon transactions to $80 with $40,000 being the highest transaction. Customers use the same seamless experience in transactions on other sites too. That’s the reason Amazon Payments witnesses a high growth in its customer base each year. So, this is a really important part, as you are supposed to be paid back on time. What happens is, Amazon Pay withholds a minimum amount in your account. This is known as Reserve. Reserve is usually kept to secure payment obligations, refunds, and guarantees. You receive your first disbursement on the 14th day of your first transaction. 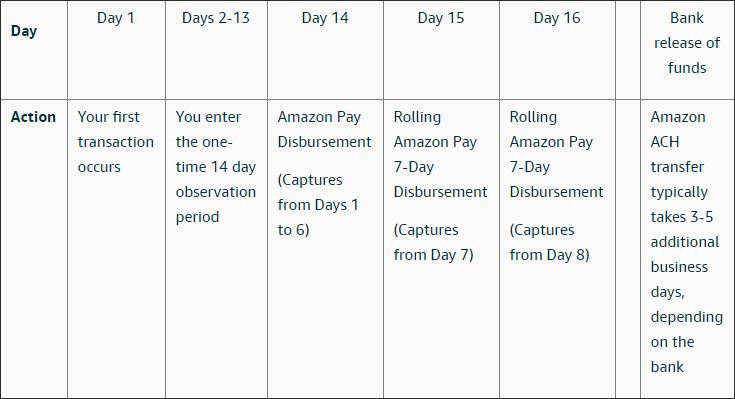 Here is the typical flow of payments from Amazon Pay to the merchants. Apart from the ones discussed above, there are a few more that helps with the popularity of Amazon Pay. Amazon brings its huge customer base from its eCommerce business itself. Around 300 million customers across the globe have already used this payment gateway as a part of it. Anyone having an Amazon account will be more than happy to see the gateway on your online store. Without any monthly subscription, or setup fee, Amazon payment fees are based on per transaction. This transaction fee has two components. One is the Processing Fee and the other is Authorization Fee. The domestic transaction fee is 2.9% and the authorization fee is $0.30. This is exclusive of the tax, if applicable, and are charged only when the transaction is executed. For instance, any $10 transaction from your website will have the total transaction fee of $0.59, for domestic and $0.69 for international transactions, as per the standard rates. Both the domestic and international processing fees are refundable. Authorization fee is not refundable. Since no annual/monthly fee is charged, you can keep your account open and pay as per your usage. Still, if you need to close accounts, you just have to contact their online support and get it closed. There are quite a few options to set up Amazon Pay on your WooCommerce store. Here are a few. This Version of Amazon Payments Gateway for WooCommerce is available at the ELEX at $59.00. Apart from the basic transaction functionalities, you can have an overview of the transactions going on. You get to know the amount which is captured, the amount which is recurring, and amount of refund settled. You can also set the time period of the overview. Adding Amazon Payment Button on the Cart Page, for faster checkout. The Amazon Payment Button can be customized through the Settings page. Large banners are available in three colors and can be placed at multiple specific places on the cart and checkout pages. WPML is also supported with languages like French, German ( Deutschland ), Italian, and Spanish. The screenshot here shows the Amazon logos at the Cart and Checkout Pages. These can be customized to make it look better. With the Premium Plugin, you get a year of Premium Support and Updates of the Plugins. You also get a 30-day Moneyback Guarantee, in case Amazon Payments Gateways is not suitable for your site. 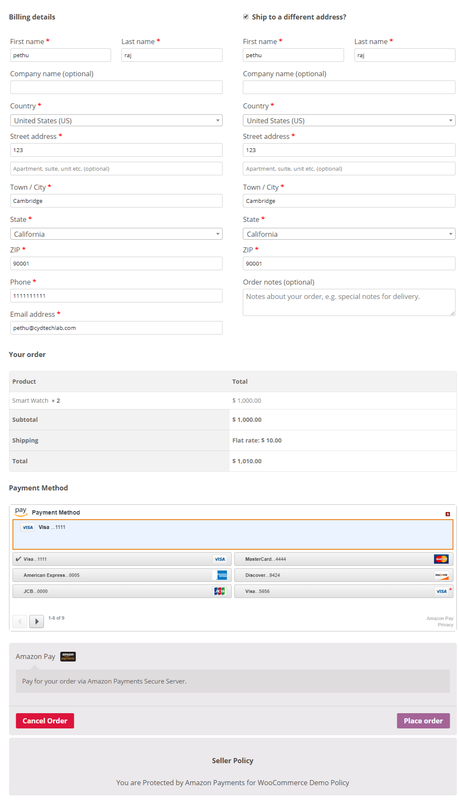 This is the basic version of ELEX Amazon Payment Gateways for WooCommerce and good enough to let your site accept payments and get paid by you Merchant bank. This is developed by WooCommerce and is free of cost. Since this is open source extension, it comes with very basic functionalities. This extension allows you to accept payments and transfer funds to your merchant accounts. Its features are comparable to ELEX Amazon Payment Gateway for WooCommerce. The open source/free versions of the gateways don’t provide the recurring payment options, which can be a really nice feature to lose out on. Recurring Payment and other premium features are supported with Amazon Pay on the purchase of WooCommerce Subscriptions, priced at $199/site. Choosing the right payment gateway can be tough. However, Amazon Payments Gateway for WooCommerce has features that attract a lot of store owners to it. The ease in payments transforms a guest visitor into a regular buyer. I fact, the introduction of recurring payments has helped to maintain the customer loyalty. Customers are prompted to log in to Amazon account, to access the already saved details. In this way, your customers experience a familiar, trusted and swift checkout. As a whole, this payment gateway can help you get new customers, retain old customers, and maintain the trust of the customers. This eventually leads to the growth of your business. For any query, leave a comment below or contact your online support. We’ll be happy to get back to you. For more information on products visit your product page. To explore more details about the plugin, go check out ELEX WooCommerce Amazon Payment Gateway plugin. or read the product documentation to know every feature of the plugin, in detail.